Do you hear scratching, chirping or rustling in your attic or walls? See bats entering or leaving the structure of your building? See piles of feces or guano on your roof or under the eaves? Have you had a bat enter your living space? You most likely have a colony of bats in your home or building. Bat removal and bat control is one of the more common problems that Weaver’s Wildlife Control deals with on a daily basis. Bats are protected in most every state in the nation and have to be removed according to state rules and regulations. If you are having trouble finding a qualified bat removal company, please feel free to call Weaver’s Wildlife Control. Bats become a problem because of their repetitive nature. They like to roost in the same areas every night. This is where the problem begins. Bats are attracted to live in dwellings such as homes, buildings and older buildings such as churches and farmhouses. The constant build up of guano (bat droppings) is one of the most common problems that people encounter with bats in homes and buildings. Guano may provide a growth medium for microorganisms, some of which are pathogenic(e.g., histoplasmosis) to humans. Histoplasmosis is a common lung disease caused by a microscopic fungus. Droppings from bats tend to be segmented, elongated, and friable. When crushed, they become powdery and reveal shiny bits of undigested insect remains. The species most often encountered in and around buildings in Virginia are colonial and include Little brown bats and Big brown bats. Bats tend to inhabit structures that have significant exposure to sunlight, are large, and are within half a mile of a fresh water source. Bats often roost on the outside of buildings, behind shutters, and where the siding and edge boards are not joined properly, lapped, or sealed. For the management of bats, the focus should be on any gap measuring approximately 1/4 x 1 1/2 inches or holes measuring 5/8 x 7/8 of an inch. Smaller species like the Little brown bat require an opening no wider than 3/8 of an inch. Discovery of rub marks, bat guano, and sightings of bats, coupled with client information usually are sufficient to confirm the presence of bats. The most common call that we receive is a customer with an individual bat flying around the living space of their home. This is the first indication that there could be a bat infestation in a particular building. The bats that are usually found flying around the living area are typically juvenile bats that somehow lost their way. When this happens a full and complete bat inspection should be performed by Weaver’s Wildlife Control. Bat removal can be relatively expensive and only certified licensed professionals at Weaver’s Wildlife Control should be contracted. We do not harm any bats in the removal process. We allow the bats to leave on their own. The process could take seven to ten days for all bats to be removed. An additional service we offer along with Bat Exclusion is Bat Guano Cleanup. There are many hazards involved when extracting bat guano from the attic of your home. There is always the falling hazard, where some unqualified contractor falls through the ceiling of your home. This creates several problems. The first problem is that it breaks the sheetrock in your ceiling; the ceiling is a very difficult place to repair damaged sheetrock and often times a professional will have to be called in to make the area look correct again. The second and most important problem that this creates is it breaks the barrier that is shielding your home from the contaminates that are in your attic. When this happens your entire home will need to be cleaned and disinfected. This is very expensive and will need to be done by a company that specializes in home remediation. Weaver’s Wildlife Control is fully licensed and insured and we have many years of experience and training in Bat Exclusion so you will never have to worry about this happening to you or your home. No one wants to share their home with any unwanted pests. Having bats invade your home can be an emotional and frustrating situation. 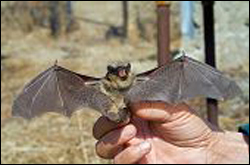 Weaver’s Wildlife Control is ecologically responsible, ensuring that only environmentally sound solutions and humane wildlife removal techniques are used for all Bat Exclusion situations. Weaver’s Wildlife Control is here to help you take back your home.